Give your patients the support and symptom relief they need. Sign up for AZO product samples online today. AZO products help with UTI pain relief, infection control, urinary tract protection, UTI detection and bladder control. * Find out how AZO products may help your patients. Almost half of all women will experience one UTI during their lifetime.1 Consider these options for protection,* symptom relief and control, and detection. Review clinical studies of the key ingredients in AZO products and download teaching tools for your patients. 1Foxman B. Epidemiology of urinary tract infections: incidence, morbidity, and economic costs.Dis Mon. 2003 Feb; 49(2):53-70. 2National Institute of Diabetes and Digestive and Kidney Diseases, U.S. Department of Health and Human Services. Urinary Tract Infection in Adults. Available at: http://www.niddk.nih.gov/health-information/health-topics/urologic-disease/urinary-tract-infections-in-adults/Pages/facts.aspx#ft1. Accessed March 28, 2016. ∞ Helps inhibit the progression of infection until you see a health care professional. AZO is not intended to replace medical care. 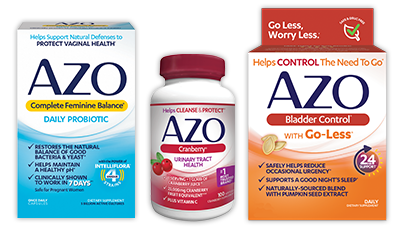 †The AZO brand portfolio of products is the #1 Most Trusted Brand per Nielsen data through 8/6/16 and the 2016 Pharmacy Times Survey (Urinary Pain Relief, Cranberry Supplements, and Yeast Infection Prevention and Treatment). ††Biological activity of 10oz cranberry juice cocktail. AZO Urinary Pain Relief®, AZO Urinary Tract DefenseTM, AZO Cranberry®, AZO Test Strips®, AZO Yeast®, and AZO Bladder Control® are trademarks of DSM.